Teachers, check out all of our latest Christmas Worksheets, Christmas Activities, and Winter Activities on Have Fun Teaching! These Christmas Resources are perfect for your classroom lesson plans. Your kids will have a blast in the month of December...and so will you! 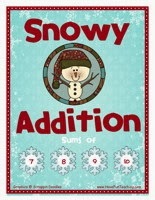 Christmas Worksheets - Huge selection of Christmas themed worksheets. Christmas Activities - Huge selection of Christmas and Winter Themed activities.